John Vance Auto Group has been very proud to sponsor the Oklahoma Farm Bureau for over 25 years. 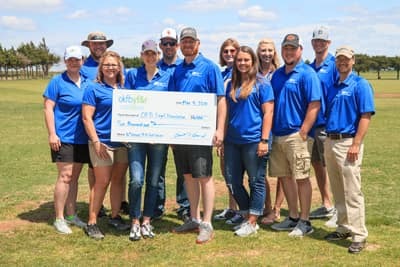 The Oklahoma Farm Bureau Young Farmers & Ranchers raised more than $6,000 at their annual golf tournament to help fire relief efforts for rural Oklahomans and support the Oklahoma Farm Bureau Legal Foundation. The tournament was held Friday, May 4, at Cedar Valley Golf Club in Guthrie. Fifteen teams competed in the scramble-style tournament, which is coordinated by the OKFB YF&R state committee. The Cleveland County Farm Bureau team won first place with Kent Washburn, Marty Fuller, Jim Packer and Freddy Wisdom. Oklahoma AgCredit came in second with team members Kyle Fir, Butch McComas, Steven Davenport and Marty Meyor. The third-place team was the Alfalfa County Farm Bureau team with Terry Ryel, Curtis McMahan, Chad Kisling and Eric Smith. The top three teams had their choice of gift cards and tickets to both University of Oklahoma and Oklahoma State University football games. The prize for longest drive was given to Amy Wilson. Title sponsors for the tournament were BancFirst, Caddy County Farm Bureau, John Vance Auto Group, McAfee & Taft, Oklahoma Farm Bureau Insurance, Oklahoma Youth Expo, Pottawatomie County Farm Bureau, Rachel Pickens Realtor, Servicemaster of Stillwater, The Oklahoma Pork Council and Woodward County Farm Bureau.